The Savannah is Tim O'Brien Homes' newest design, featuring high ceilings, open-plan design, and a split-bedroom ranch layout (Photos: Ray Guansing). Tim O’Brien Homes can’t be accused of being set in its ways. The Wisconsin builder’s Gold-winning NHQ application for both its Milwaukee and Madison divisions has at least seven initiatives the company embraced that were recommendations from the judges who had graded the company Silver during the previous two years. 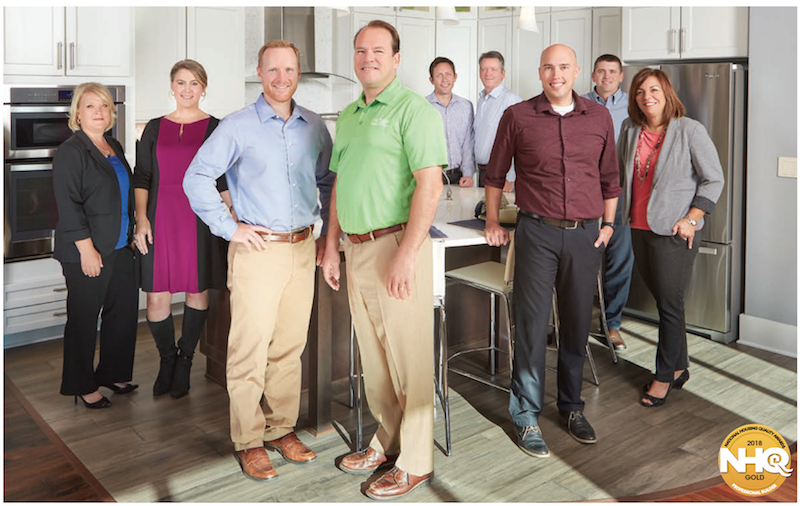 The Tim O’Brien Homes team, from left to right: Amy Boczkiewicz, HR director; Mandi Kohlmetz, marketing director; Matt Neumann, partner; Tim O’Brien, president; Craig North, VP of construction; Dan Gorski, VP of purchasing and design; Daniel Lowery, Madison division president; Corey Gerth, sales director; Angela Cooper, Milwaukee division president. Following another NHQ suggestion, a quality assurance specialist position was created to bring a big-picture perspective to the field, which is supervised by as many as eight construction managers. To avoid the pitfall of construction managers developing tunnel vision and focusing too intently just on issues that affect their specific projects, the QA specialist assesses the field with a more global company view and can identify patterns from the punch list manager and warranty database, helping flag flaws in workmanship, process, or product. Other NHQ recommendations acted upon include revamping employee training with programs that provide more focused topics for coaching specific disciplines within the company, and safety audits and safety education by a consultant from the builder’s insurance carrier. Another departure from the industry’s “We’ve always done it this way” syndrome is evident in the way O’Brien partners with building science experts, suppliers, and subcontractors to conduct its own research and development. That effort yielded a new wall-framing system that is user friendly for assembly in Wisconsin winters and delivers the same energy efficiency and air infiltration metrics as the company’s previous system but at a lower cost. By December, the builder expects to build the first of 36 houses in what will be Wisconsin’s first net zero energy community, and students from a local high school’s building trades program will be working alongside professionals on one of those homes. The net zero house will be one of three programs O’Brien will roll out next year with high schools in its markets—the builder is also developing a fourth—where teenagers spend part of the school year working 7:30 a.m. to 10:30 a.m. on a Tim O’Brien house and learning about the building trades as a career option. The judges lauded the builder for its solid technology infrastructure to support company performance. The list of platforms includes Sage, BuilderMT Workflow Management Suite, Sales Simplicity, Punchlist Manager, and Autodesk Revit building information modeling (BIM) software. The BIM software played a role in bringing architecture in-house. 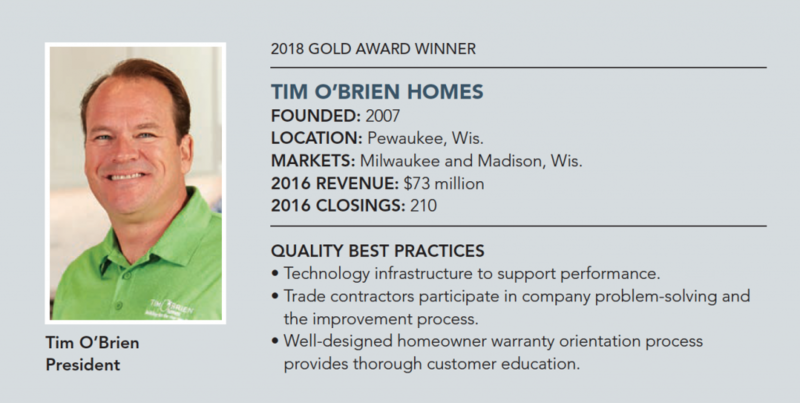 As part of that process, Tim O’Brien Homes converted its purchasing agents into a new position called virtual design coordinators. The purchasing team was trained to be drafters using BIM to draw 3-D house plans. Those plans are laid into another system that breaks it down into a list of materials units that the design coordinators then use to cost out purchase orders for a particular home. That in-house ability also sweetens O’Brien’s relationship with trades because Tim O’Brien Homes isn’t going to ask subcontractors to produce estimates for building supplies. “It’s good for trade relations because we’re trying to find any way possible that will lower the total overall cost of doing business with our vendor partners, and this is just another piece where they don’t have to invest [time or money] in providing takeoffs for us,” says Daniel Lowery, president of the Madison division. Another example of lean process and streamlining is the adoption of Punchlist Manager software, which paved the way for testing a new process for submitting and tracking purchase orders. Orders are approved online and then directly emailed to the subcontractor to complete the work. Then the trades can simply submit the PO for payment. The software also streamlines the warranty process with homeowners, who can log in to the program and submit their punch list items for the 60-day and 11-month warranty reviews. The customer care team also uses Punchlist Manager to track product defects, aging warranty items, trade trends, and warranty costs. These systems are part of Tim O’Brien Homes’ effort to make business decisions based on data rather than on instinct. And this information is valuable. For instance, when the warranty team is trying to solve a defect, they can approach the trade partner responsible with data that shows there is a pattern for a recurring problem, rather than just offering an opinion. As O’Brien performs advance planning for entering new markets in Milwaukee and Madison, data also will be used to study price points, room count, what should be the focus of the living space, and what in a house most attracts target buyers for those communities. The data system enables quicker decision-making and captures knowledge that Tim O’Brien Homes can tap if employees aren’t available or no longer work for the company. O’Brien reached NHQ Gold using the Entrepren­eurial Operating System (EOS), a strategic planning method that many NHQ winners use, which is based on the best-selling book Traction: Get a Grip on Your Business, by Gino Wickman, and advocates that companies begin short- and long-term planning by first identifying strengths, weaknesses, opportunities, and threats (SWOT) to the business. The O’Brien team is even tweaking that method by incorporating quality-management tools inspired by Verne Harnish’s book Scaling Up (Rockefeller Habits 2.0), the sequel to Mastering the Rockefeller Habits, which preaches that executives need to make the right decisions about people, strategy, execution, and cash in order for a business to grow properly. PACe, or the Process Accountability Chart, is a Rockefeller tool that the O’Brien team is using to connect the company’s major processes to those four buckets. All of the flowcharts, policies, and procedures for one bucket are assigned to one person who is accountable for everything in that process. Managers already use a Scaling Up exercise to think differently about cash flow by looking at ways to improve the sales, production, and delivery cycles. Even metrics, which primarily are lagging indicators, are being scrutinized, and managers are considering adopting leading-type indicators to help project trends and where they are heading. “It’s a lean mindset. As we become more sophisticated in our data collection, we find that we need to layer on some additional tools that Traction doesn’t offer but that Gazelles [Harnish’s executive coaching company] mirrors, so we can layer right on top more performance improvement metrics, opportunities, and controls for the organization,” O’Brien says. 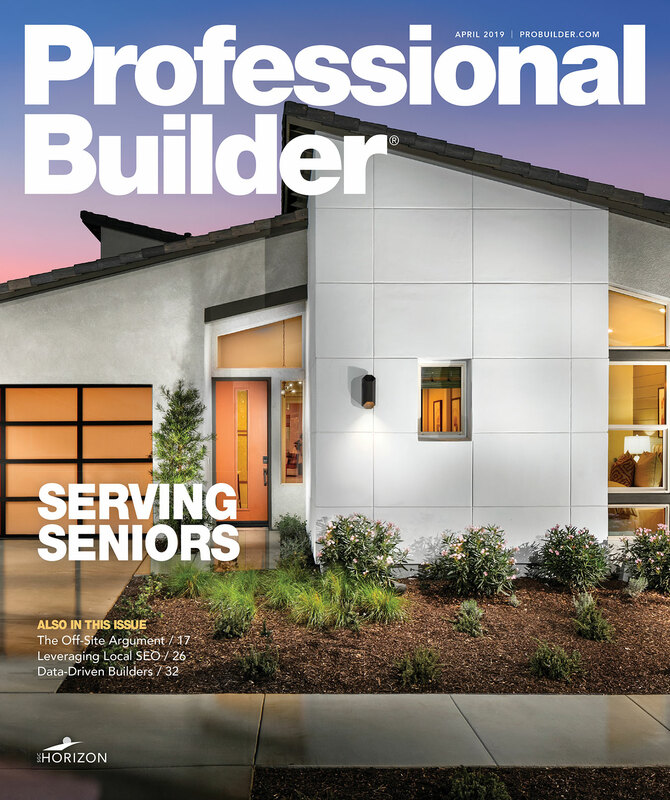 Mike Beirne is the senior editor of Professional Builder and Custom Builder magazines. A two-time Jesse H. Neal Award winner, Mike has nearly 30 years of journalism experience plus numerous news and feature writing awards, including honors from the Society of Professional Journalists, the American Society of Business Press Editors, and the National Association of Real Estate Editors. He also operated a masonry restoration business for more than two decades.